Fulfilling the Edina Community Foundation's mission to serve, strengthen, and celebrate our community, the Connecting with Kids program is specifically focused on the lives of our youth. The Connecting with Kids program grew out of a desire to build a healthy Edina for youth. In 1998, an Edina Asset Building Steering Committee partnered with the Minneapolis-based Search Institute to establish the "40 Developmental Assets," to create healthy kids and a healthy community. These assets identify areas in which neighbors, parents, teachers, and our community need to actively participate to help kids become their very best. Since coming under the Edina Community Foundation umbrella, the Connecting with Kids program has added an emphasis on recognizing the adults who have dedicated their time to making a difference. Each year since 2008, the Edina Community Foundation holds a leadership breakfast to honor a group of awardees who are nominated by community members. We take time to highlight their contributions and celebrate the strength of our community through volunteerism. Our 2019 Leadership Breakfast was held on March 1. Mark your calendar for our 2020 event on March 13. This event would not be possible without the sponsorship of local businesses who are invested in Edina. We’d like to thank our 2019 sponsors. Past Award Winners: Read a list of our award recipients, going back to 2009. Thank you to each and every one of them for making this community what it is today! If you missed the 2019 breakfast, watch the slide show below for a recap of this inspirational event. 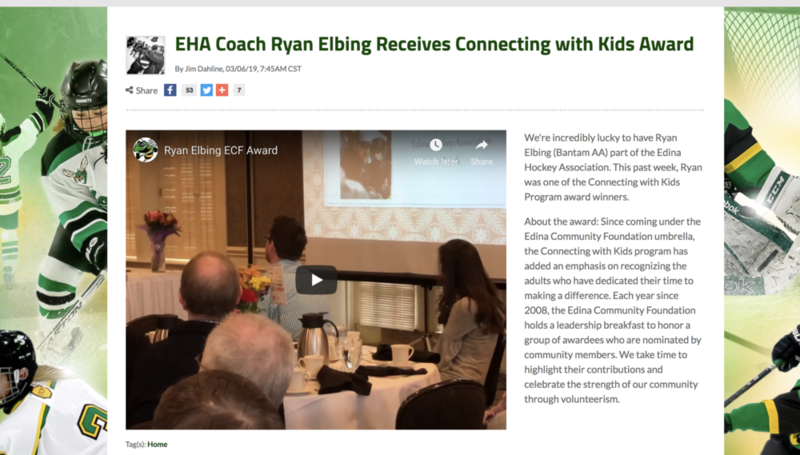 Read Jim Dahline’s story on EHA Coach Ryan Elbing, 2019 CWK Leadership Award Winner. To connect individuals, families, organizations and other resources in Edina to help them fulfill their responsibility to raise healthy children and develop a healthy community. To be a community where all children have the support they need to grow up to be responsible, healthy and caring adults.